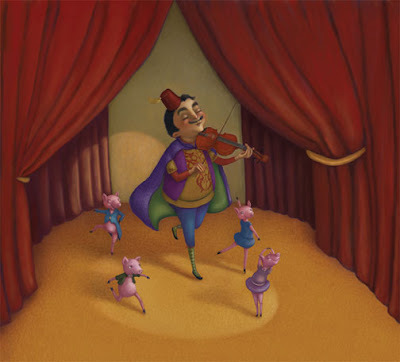 Pomodoro and his Performing Pigs - a bit of theater inspired by Lloyd Alexander's "The Rope Trick." 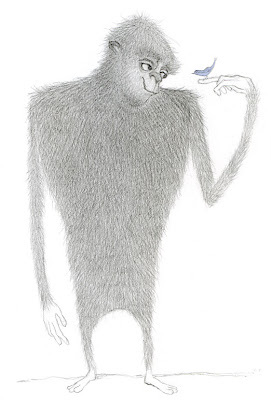 The softer side of a legendary creature: Bigfoot meets the Bluebird of Happiness. I made this sketch for a story I'm working on. 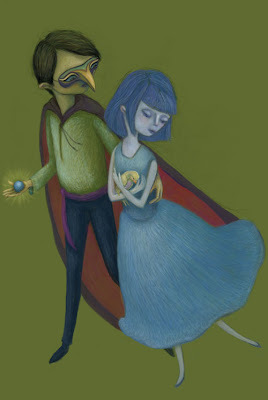 It seemed perfect for this Illustration Friday post, so I decided to scan it and paint it in Photoshop. In this scene, Wynne and Claire are pretending to act naturally as they try to spirit away the golden bird. In the true spirit of Illustration Friday, I decided to give myself one hour to do this sketch. Making the sketch in that time was no problem; it was setting up the blog that was a hassle. But here it is - my one hour sketch. 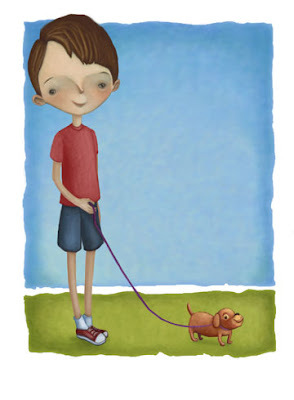 Of course at this point it's technically Illustration Saturday, but I did it! I draw pictures and write stories in a little cottage near the sea.